This past weekend was nothing but relaxing and entertaining! My wife flew from San Diego to Phoenix, so I was able to take a break from driving all the way to California. Knowing that we were in a time crunch, we decided to visit Plato’s closet to sell some of our clothing, and visit Fashion Square and Arrowhead Mall. We are heading to Hawaii in late August, so we began our quest to find bathing suits, trunks, and other necessities! Since the weather was nice outside, for a change, I decided to go casual on top, and dressy on the bottom. 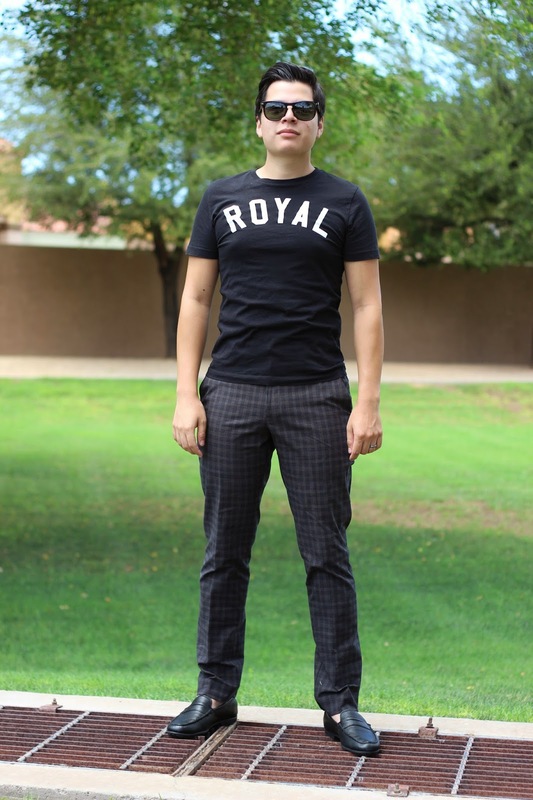 I found this “Royal” tee from 21Men a few months ago and I decided to play it out with these plaid pants from Kenneth Cole. Finishing touches include a pair of Persol Sunglasses and Ralph Lauren Loafers.